The Capitol Civic Centre is CLOSED today, so tonight’s auditions are cancelled. Our second night of auditions will take place TOMORROW (WEDNESDAY), Feb. 13, at 7:00 PM, at MEADOW LANES NORTH – in the lower level (basement). Please pass the word on to others who may be interested. If you’re coming tomorrow, don’t forget to bring a list of date conflicts for March and April. Directors will cast the show after auditions tomorrow! If you have any questions or conflicts re: the change, PLEASE contact us ASAP and we’ll see what we can do! Thanks! So, with this nasty weather, the auditions scheduled for tonight (Thurs, Feb. 7) are CANCELED! Here’s what auditions dates/times will look like. We will have auditions as scheduled on Sunday, Feb. 10, at 1:00. We will then have our second date for auditions on Tuesday, Feb. 12, at 7:00. Directors will then cast the show Tuesday after auditions. Auditions will still take place in the Mertens Family Lobby/Kadow Movie Museum at the Capitol Civic Centre. We apologize for the inconvenience, but safety first! IF you have conflicts with both times or have questions, please contact us. We look forward to seeing you either Sunday or Tuesday! Don’t forget to bring along any schedule conflicts and your OH SO BEAUTIFUL singing voices! Be safe! We are excited to announce the dates and times for our 2019 Heart-A-Rama auditions! You must be at least 21 years old to audition. Auditions are pretty tame. You will be asked to read from a provided script and sing a brief song (it can even be “Happy Birthday!”). We’d love to see you! Please bring a list of scheduling conflicts for March and April. If cast, you must be available for all scheduled rehearsals, dress rehearsals on April 28 and 29, and performances. Shows will be May 2-4 & 9-11at the J.E. Hamilton Community House in Two Rivers. Heart-A-Rama Goes Country! 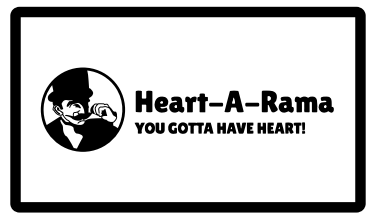 The official logo for Heart-A-Rama Goes Countryis here! A HUGE thank you goes out to Stephanie and David Carpenter for their amazing design! Heart-A-Rama Goes Country” show dates are May 2,3,4 and 9,10,11, 2019 and tickets are available to purchase online right now! Looking for a Valentine gift for that special someone? How about a date night at Heart-A-Rama 2019? Show dates for Heart-A-Rama Goes Country are May 2, 3, 4, and 9, 10, 11. If you purchase online tickets from January 16 through February 28, 2019, you will receive a special Heart-A-Rama chocolate bar (on the night you’re at the show) newly created and donated by Beernsten’s! Each ticket holder receives a delicious bar to enjoy! You buy six tickets; you receive 6 chocolate bars. Heart-A-Rama tickets are the perfect gift for your sweetie! Get yours today! Looking for a Christmas gift for that special someone? How about tickets to Heart-A-Rama?!? Heart-A-Rama Sweetheart ticket buyers are also included in the drawing. Show dates for “Heart-A-Rama Goes Country” are May 2,3,4 and 9,10,11, 2019! Heart-A-Rama tickets are the perfect gift! Get yours today! With the 2018 Stay Classy Heart-A-Rama underway, check out a some preview photos below! As a reminder, tickets will remain on sale on the Website and at the Piggly Wiggly in Manitowoc and TR until the day of the final performance. You may also purchase tickets at the door, however we can only accept cash or check at the door. Heart-A-Rama is very appreciative of the wonderful support our local Manitowoc community provides us year after year, so come on down and be apart of something life changing. View the photos below, or check them out via Google Photos. With our show dates of April 26, 27, 28 and May 3, 4, 5 fast approaching, now is the perfect time to pre-purchase your tickets. Tickets can be purchased in-person at either the Piggly Wiggly in Manitowoc or Two Rivers, tickets purchased at either location are sold for $15 a ticket. Also, for the first time ever you have the convenient option of purchasing your tickets online. Our ticket prices online are sold at $16 dollars a ticket and offer the convenience of being mailed directly to you. Our venue and event information can be seen below and as always if you have any questions, feel free to contact us on either our Facebook page or by the Contact tab on our website!! Food is available before the show until it is sold out. Drinks are available before and during the show. Heart-Dogs are available at intermission. Popcorn is FREE all night. We at HAR would like you to enjoy the Stay Classy Heart-A-Rama 2018 Logo! Just a little fun fact about the below logo, we haven’t had a navy design since 2010. Design and compliments go out to the ever wonderful and talented Stephanie Carpenter. With 2018 just around the corner, we at Heart-A-Rama want to remind everyone that the 2018 audition times are also quickly approaching. The theme for our 48th year will be Stay Classy Heart-A-Rama and will feature some fun performances such as: The Kewaunee Hickbillies, Dancin’ Fool, People wanting to be a Millionaire, and Sinnerella as this years musical. Auditions will be held on February 8th (Thursday) in the Capitol Civic Centre Mertens/Kadow Room at 7:00 PM. We will also have a second audition on February 11th (Sunday) in the Capitol Civic Centre Mertens/Kadow Room at 1:00 PM. Our show dates are April 26, 27, 28 and May 3, 4 and 5 at the J.E. Hamilton Community House in Two Rivers. For a full list of important Heart-A-Rama date/times, please click here. If you are interested in becoming part of the Heart-A-Rama team(and are 21 or older), we hope to see you there.